According to the Centers for Disease Control, in 2011 more than 650 children aged 12 and younger died as occupants in vehicles. Proper car seat use can drastically reduce the chance of injury for children when they are involved in a motor vehicle accident, but data shows oftentimes even when car seats are installed, they are installed incorrectly. Of the children who died in 2011, a full third were not buckled in at all. Experts have found child restraint systems are often used incorrectly. One study cited by the CDC found 72 percent of nearly 3,500 car and booster seats that were checked were misused in such a way that would increase the risk of serious injuries in a crash. 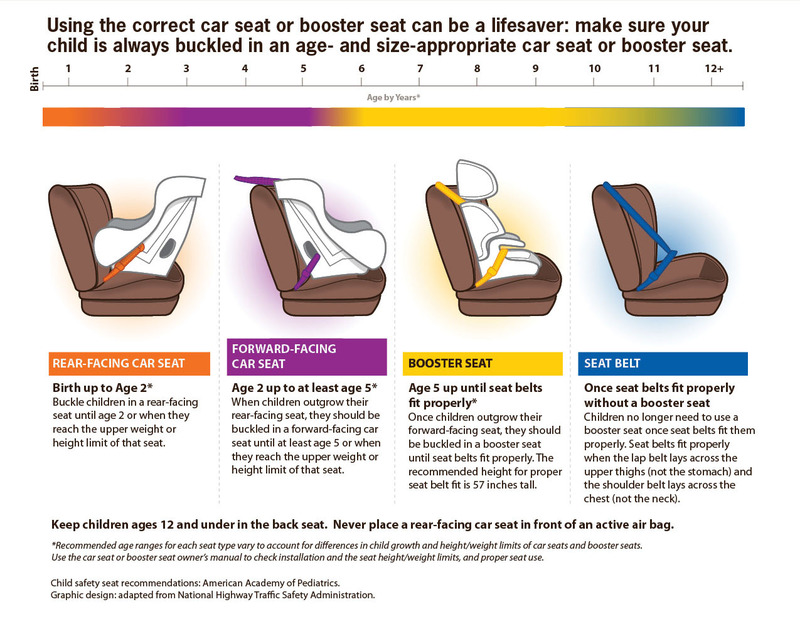 This graphic on the cdc site helps guide parents when choosing and installing car seats for their children http://www.cdc.gov/motorvehiclesafety/images/child_passenger_safety/VS_cps_image_fullsize.jpg . Birth up to Age 2 – Rear-facing car seat. For the best possible protection, infants and children should be buckled in a rear-facing car seat, in the back seat, until age 2 or when they reach the upper weight or height limits of their particular seat. Check the seat’s owner’s manual and/or labels on the seat for weight and height limits. Age 2 up to at least Age 5– Forward-facing car seat. When children outgrow their rear-facing seats they should be buckled in a forward-facing car seat, in the back seat, until at least age 5 or when they reach the upper weight or height limit of their particular seat. Check the seat’s owner’s manual and/or labels on the seat for weight and height limits. Age 5 up until seat belts fit properly – Booster seat. Once children outgrow their forward-facing seat, (by reaching the upper height or weight limit of their seat), they should be buckled in a belt positioning booster seat until seat belts fit properly. Seat belts fit properly when the lap belt lays across the upper thighs (not the stomach) and the shoulder belt lays across the chest (not the neck). Remember to keep children properly buckled in the back seat for the best possible protection. Once Seat Belts Fit Properly without a Booster Seat– Children no longer need to use a booster seat once seat belts fit them properly. Seat belts fit properly when the lap belt lays across the upper thighs (not the stomach) and the shoulder belt lays across the chest (not the neck). The recommended height for proper seat belt fit is 57 inches tall. For the best possible protection keep children properly buckled in the back seat. If a child you love has suffered serious personal injuries in a motor vehicle accident, you may want to speak with Kansas City Car Accident Attorney Janelle Bailey who can review your case. Call today for a free, initial consultation.